BikeIT company aims to offer you high quality services in renting, technical support and sale of bicycles and cycling equipment together with cycling routes across Thessaloniki. The company is headquartered in the beautiful city of Thessaloniki. Our store is in the redeveloped new coastal area in front of the Macedonia Palace Hotel. 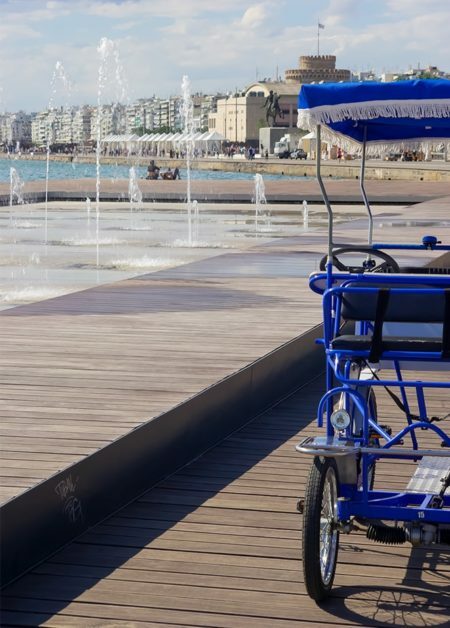 The company’s vision is to promote an ecological and alternative way of transport to the citizens and guests of Thessaloniki and to enhance the citizen’s ecological consciousness. The company has developed strong cultural actions regarding cycling and urban cultural activities. Such actions are the OpenBikeThessaloniki contributed by OpenHouseThessaloniki, the TEDxUniversity of Macedonia and the Ecoweek Thessaloniki in which the company provides part of its bicycle fleet. Finally, BikeIT is aware of social responsibility and solidarity issues. Every year it supports organizations and city’s associations such as SOS Children’s Villages, Hellenic Red Cross, Melissa Orphanage, Foundation of Blind of Northern Greece “ILIOS”, the Association of Parents and Guardians of Greece of children with cystic fibrosis etc.